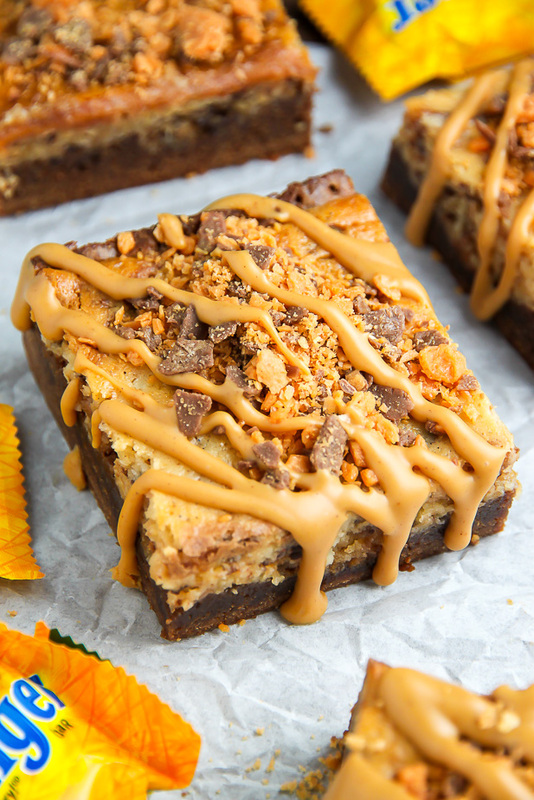 These Creamy Butterfinger Cheesecake Brownies are drizzled with peanut butter glaze!!! 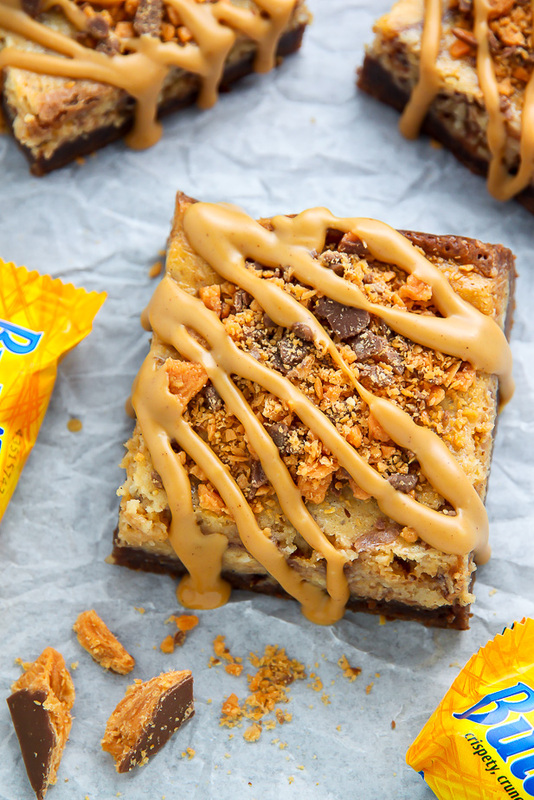 They’re creamy, crunchy, and a butterfinger lovers dream come true! I visited my bestie Jenna in NYC last week for a much needed girls day. When I spotted not one, but TWO, giant packs of mini butterfinger bars sitting on her counter, I knew it was a sign. After we did some shopping (because, hello… NYC!) and sipping (I made these mimosas!) we headed back to her apartment where I raided her fridge and set off to make us something sweet. And that, my friends, is where these fabulous butterfinger cheesecake brownies were born. Oh. So, um… let’s just get this one little thing outta the way right now. This recipe is NOT diet food. I repeat, NOT diet food. These cheesecake brownies are loaded with chocolate, butter, sugar, cream cheese, and butterfingers. Are they are worth every single calorie? Hell to the yes. When I recreated these butterfinger cheesecake bars the second time I decided to up the ante by adding a delightfully drippy peanut butter glaze. Not only is it delicious, but it makes the presentation extra pretty. Delicious decorations fo’ life!!! The best part? Making this dreamy glaze is so simple. You’re simply going to melt some peanut butter, then stir in a dash of confectioners’ sugar. That’s it! Just be sure to use creamy peanut butter; chunky peanut butter won’t work for this recipe. Note: If you’re allergic to peanut butter or just don’t like it (??? ), feel free to leave it off. These bars are magical as-is. Alright! Down to business. The first part of this recipe is the brownie base. These brownies are rich, fudgy, and exploding with chocolate decadence. They’re totally on point. And the cheesecake layer? Silky smooth and loaded with chopped butterfinger bars. What more could one ask for?! Something to keep in mind: Cooling these butterfinger cheesecake brownies completely is a m-u-s-t. It’ll take about an hour, and they smell SO good, so get ready to practice your patience. Intensely rich and fabulously fudgy chocolate brownies + silky smooth butterfinger cheesecake + peanut butter glaze = dessert done RIGHT. What are you waiting for?! 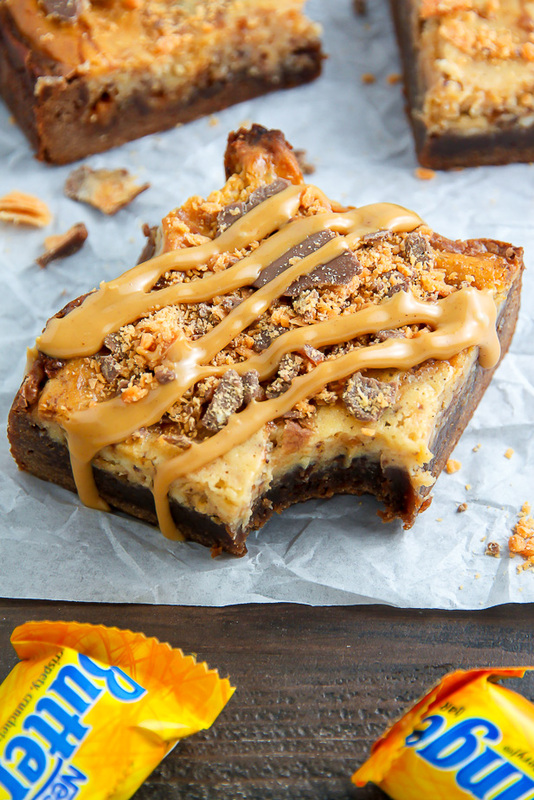 Go treat yo’ self to a batch of these butterfinger cheesecake bars! 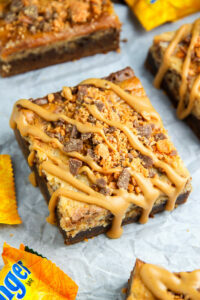 Rich chocolate brownies topped with creamy butterfinger cheesecake! These bars are incredible. Preheat oven to 350 degrees (F). Line an 8x8 inch square baking pan with parchment paper; spray parchment paper and any exposed pan lightly with non-stick spray; set aside. Melt butter and chocolate in a small saucepan over medium-low heat, whisking occasionally, until completely melted; whisk smooth and remove pan from heat. Pour melted chocolate into a large, heatproof bowl and whisk in the sugar, beating well. Add in the eggs and egg yolk and beat smooth. Gently whisk in the salt and flour, stirring until just combined. Pour batter into prepared baking pan, smoothing the top with a rubber spatula. Using a handheld mixer beat the cream cheese in a large bowl until completely smooth. Add in the sugar and egg yolks and beat until smooth and creamy, about 1 minute. Fold in the chopped butterfingers, reserving 1/4 cup for later use. Pour the cheesecake batter on top of the brownie batter. Gently stir with a knife for a marbled look. Bake in preheated oven for 35 minutes, or until the edges are firm and the center is just set. Cool brownie cheesecake bars in the pan, on a wire rack, COMPLETELY before cutting. Place the peanut butter in a small sauce pan over medium-low heat, cook, stirring occasionally, until completely melted. Whisk in confectioners' sugar. Cut cheesecake brownies into bars. Sprinkle the top of each bar with a little of the reserved butterfinger crumble, then drizzle with the peanut butter glaze. These brownies really look magically delicious! Thank you, Medeja. Butterfingers + Brownies + Cheesecake = H-e-a-v-e-n. If it has “brownie” in the title I’m in, but you’re adding butterfingers into the mix so I’m 110% in! These look delicious! Thank you, Pamela! 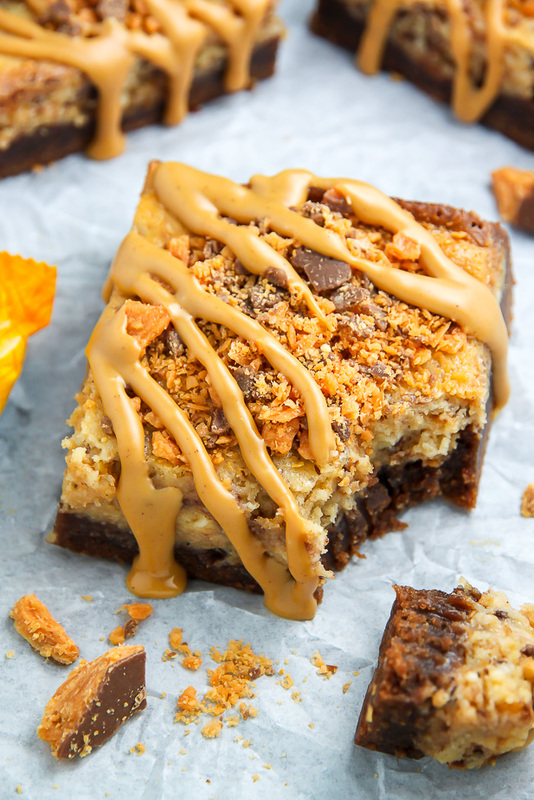 I am sucker for brownies too… but adding butterfinger cheesecake to the equation makes everything that more delicious (and dangerous haha). Aren’t butterfingers the best? I find them dangerously delicious… especially around Halloween 🙂 I hope you give these cheesecake brownies a try! All the gooey flavors are making me drool. 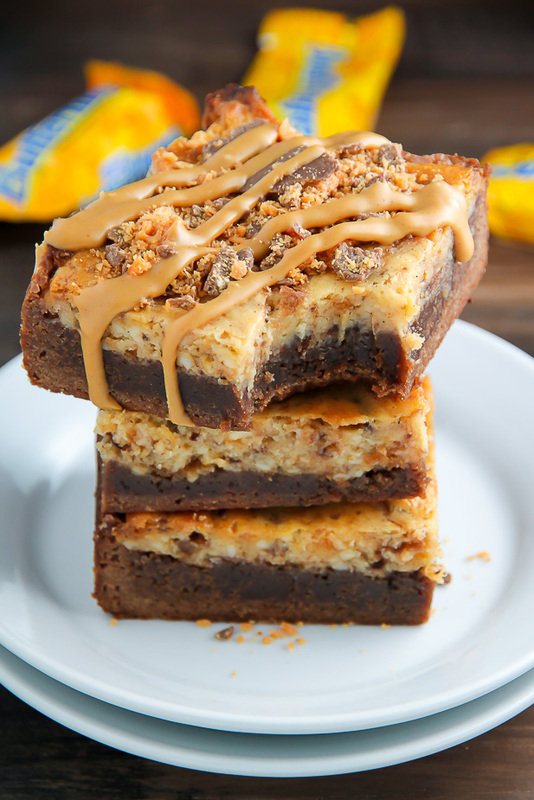 I love the combination of brownie, cheesecake, and Butterfingers. These look absolutely wonderful! I can just imagine how delightful this is! I was really excited about making these. I usually use a 9″ pan for brownies, but I wanted mine to look like yours, so I used the 8″. Well mine came out looking way thicker than yours. You might want to check, because by the looks of yours, you used a 9″. I should have gone with my gut and used my 9″. They taste good, but look way too thick for my liking. It says 2 ounces semi sweet chocolate… if I were to use chocolate chips any idea what this amounts to in terms of 1 cup, 2 cups, etc? I don’t recommend using chocolate chips as they don’t melt well. Can i double this recipe if i wanted to do a 9×13? Or would i have need to do 2 separate 8×8 pans? Can you use box brownies if you are in a hurry?